My Mum always used to say, when I was a teenager, I’d end up either in prison or in parliament. Little did she realise that they were not mutually exclusive categories these days! Or that I’d end up avoiding both (just) and finding a third, alternative, “P” – being a Professor. My route to my present occupation has been a tortuous one, to be sure. Through leaving school and home at 16 to be a lab technician for ICI, through a decade or more of radical far-left politics, including stints as a student and trade union leader, through a variety of jobs and ending up becoming an academic at the age of 37 and a Professor at 42. Along the way I learnt a lot from experience about practical politics and how real organisations work. I also read – lots. I was extremely ‘catholic’ in my non-fiction reading – everything from hard physics to soft psychoanalysis. For pleasure I mainly read science fiction – the best of which combined my loves of both science and social science in a way academic writing rarely did. I remain broadly “progressive”, or centre-left, although I have had no affiliation to any party for more than two decades. I found party politics too tribal, and anyway as a social scientist I have always thought it better to stay away from parties – except to study them. So what do I intend to ‘profess’ about here? 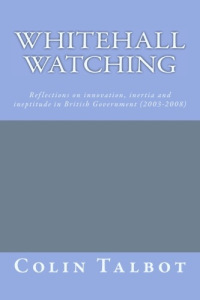 I already write extensively for academic and practitioner audiences, I blog over at WhitehallWatch and elsewhere, and I even tweet. What more is there to say? Well, there’s plenty to say about the way science, social science and political science work, for example. The clue is there in one word – “science”. I believe the principles of scientific enquiry are equally, if sometimes differently, applicable to humans as much as they are to stars, quarks or eco-systems. I do not believe there is something mystical about human beings that divorces us from the rest of the Universe, from physics, chemistry, biology or evolution. This is not to be determinist in some mechanical way – there are plenty of systems that so complex that it’s impossible to provide linear, predictive, explanations. Evolution is the best example. We know it happens. We can explain why and how it happened. What we can’t do is predict how it will happen in the future, except in some very broad and probabilistic terms, because the causal links are way too dense and complex to ever be unravelled. So with human societies, organisations, polities, etc. These are further complicated by our being unable to see inside people’s heads, or to conduct what would be unethical experiments. These are, for me, purely epistemological problems – how can we ‘know’ sufficiently about some aspects of human collective action, such as how institutions are socially constructed? But that doesn’t mean that, as some social constructivists assert, there is no objective reality ‘out there’. It’s just that it’s hard to ‘know’ it. Just as you wouldn’t use the Large Hadron Collider (LHC) to explore an eco-system, we need a specific set of tools and methods to explore human economic, political and social activity. It’s science Jim, but not as the physicists know it. So there’s a start to some of the, probably slightly random, things I’ll be sporadically exploring here. I hope its of some interest to somebody, even if it is only my son at some point in the future.